At the start of my administration, I pledged to respect each and every one of the voices of society. I presented the Consultation Process for the National Development Plan 2013-2018 at the National Palace today so that Mexicans’ good proposals will be able to guide the government. I invite citizens to participate; you are all invited to construct the National Development Plan, to shape the future of our country. We all have something important to say and experiences to share. As from today, you will be able to participate in the consultation through the new digital media. 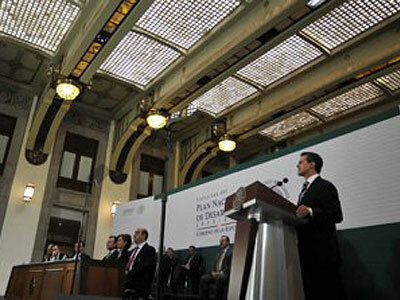 I invite you to express your views in order to transform and improve Mexico. Let us encourage the proactive, constructive spirit that distinguishes us as Mexicans. We are defining a plan to move Mexico. This joint effort will be reflected in a National Development Plan that will combine all the voices of the country in a single goal: enabling Mexico to achieve its full potential. In these six years, we will work with determination, courage and passion to transform Mexico. Let us express our views in order to transform and improve Mexico.